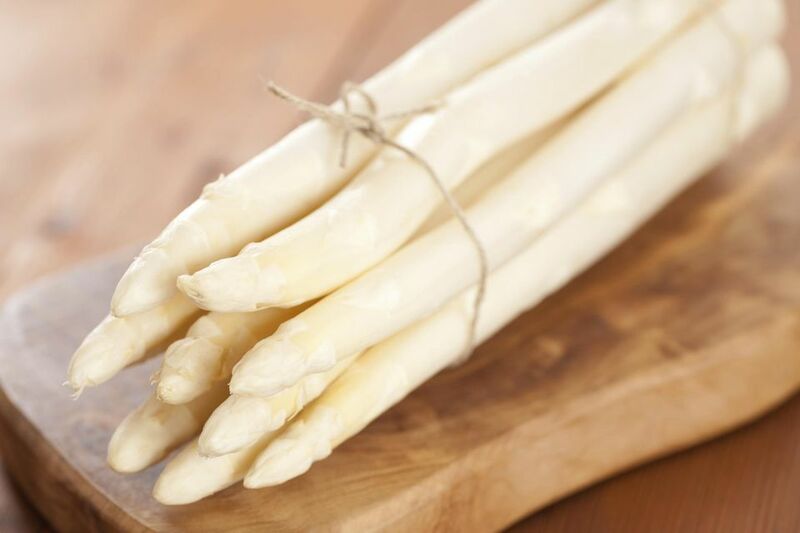 White asparagus is spargel in German. It is easy to find if you live in Germany, though it is more difficult to locate the US. German asparagus is low in calories and high in vitamins and minerals, making it a popular indulgence, although pouring Hollandaise sauce over it makes it a very substantial, special German dinner. Use locally-grown asparagus when possible. Once cut, asparagus must be handled properly to prevent drying. If it has not been kept in a moist environment, eating it would be as pleasurable as chewing twigs. Look at the cut ends. Are they dried out? Gently squeezing the ends should produce juice droplets. If you live in Germany, check with the seller before touching any produce yourself. Are the asparagus spears straight and white? The straighter and whiter they are, the more you should expect to pay for them. Violet-colored or crooked asparagus tastes the same but is harder to peel and not break, plus the violet color is considered a flaw in Germany. Is the asparagus thick and stocky? The thicker the asparagus spears, the bigger the yield after peeling, and the easier it is to peel. Do not keep asparagus more than a day or two after purchase. Keep it in a loosely-wrapped, damp kitchen towel in the vegetable drawer of the refrigerator. Handle asparagus carefully to minimize breakage. White asparagus is less flexible than green and can snap off, especially right behind the head. While it still tastes good, it is usually reserved for stock and soup at that point. White asparagus must be peeled, as the outside is fibrous and even woody at times. You can use a common vegetable peeler or an asparagus peeler. Make sure they are sharp. You may use a paring knife if you have nothing else, but you will have greater wastage. Hold the asparagus in your non-dominant hand, gripping it gently right below the head with the thumb and index finger and resting the stalk on the palm and wrist. Once all the asparagus has been peeled, cut off the cut ends about one inch up. In doing this, if you notice any more fibers sticking to the asparagus, peel it away. The pleasure in eating this asparagus is greatly diminished when you try to cut it with fiber strands still on it, or put it in your mouth and then try to chew the strands. There are several ways to cook asparagus, with steaming and boiling being the most common for white asparagus. Roasting is a good method for green asparagus. You may also use any pan which has room enough for the asparagus to lie flat in the water and not be bent while boiling. The water you are cooking the asparagus in usually contains a little butter, salt and a pinch of sugar. If you are using the water as soup stock later, you will use half the salt you would use normally. At least one pound (pfund in German) asparagus per person. Melted butter, in a gravy dish or chafing dish. Thinly sliced cooked ham or air-dried ham, or both. Boiled new potatoes, about three or four per person. An oval or rectangular serving dish for the asparagus, preheated. Chafing dish for the butter or sauces.